Dubai, UAE, March 20, 2017: The urban romanticism and eclecticism that Creative Director Alessandro Michele has infused into his collections has redefined Gucci’s codes and creativity. His distinctive and contemporary aesthetic favors gender fluidity, rich embellishments, and an unconventional vibe, all blended liberally and unexpectedly. As seen on the runway, eyewear is part of the House’s new aesthetic. Over 250 new styles developed annually feature the brand’s iconic motifs alongside novelty details, making the offering extremely versatile for the contemporary tastemaker. For spring summer 2017, the spirit of Seventies is visible on four oversized styles featuring classic colors or unexpected transparencies, with macro GG gold metal logos adding the finishing touch. 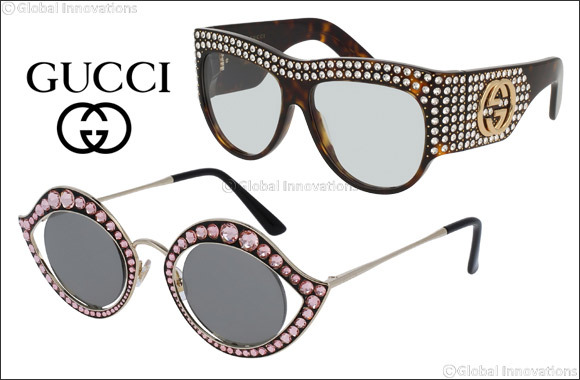 Inspired by street style, explorations and the Renaissance, along with an urban vibe, the ornate designs and details that define each pair include clusters of crystal, studs and pearls that fan out from the front to the temples, providing a vision called “Hollywood Forever”. Black acetate oversized mask-shaped women’s sunglasses with mother of pearl flower decorations and macro GG interlocking gold metal logo. Light azure or solid grey lenses. Havana acetate oversized women’s sunglasses lavishly decorated with contrasting white crystals on the front and temples. Light azure or solid grey lenses and macro GG interlocking gold metal logo. Pink acetate oversized squared women’s sunglasses with all-around frontal tonal crystals and lenses. Macro GG interlocking gold metal logo. Black acetate rectangular women’s sunglasses with pearls and studs on the front and temples. Light azure or solid grey lenses and macro GG gold metal logo. Inspired by dreamy explorations, the Gucci SS 2017 collection channels a number of references in a kaleidoscope of colors, interpreted with eccentric touches, decorative impulses, nautical moments and exclusive slogans delivered with a gender-blurred quirkiness and sophisticated craftsmanship. A testament of opulent luxury, these unisex shades in premium acetate and titanium are part of the Made In Japan Collection entirely Made in Japan according to the highest form of hand-crafted expertise. Melding legacy with innovation, they are characterized by exclusive details such as a handchiseled double bridge, braided motifs and adjustable nose pads that grant the perfect fit. Extremely versatile, they easily adapt to both sun and optical versions. These trendy and unisex round-shaped sunglasses in titanium and acetate feature a sophisticated d�cor on the temple. Easily adapting to both sun and optical versions, they are part of the Made In Japan Collection that is entirely Made in Japan according to the highest form of hand-crafted expertise. Inspired by British culture, legacy and aesthetic, the Cruise 2017 collection was full of color, romance, retro flourishes, all with an urban edge. At once precious and playful, these sophisticated Sixties-inspired women’s sunglasses, in black or havana brown acetate, recall the shape of an eye. They feature acetate temples subtly and Gucci logo metal sticker and are matched to clear, gray or nicotine brown lenses. The distinctive retro shape of these cat eye women’s sunglasses is further defined by a delicate mother-of-pearl floral motif on the acetate front. Equally inventive are the clear lenses that convey a very refined look. These exclusive flip-up men’s pilot sunglasses in acetate exude a whispered and intimate luxury given by the transparent acetate that reveals precious yet subtle hand-chiseled motifs in the inner part of the temples. Available in combinations of dark havana with light horn or black matched to blonde havana with azure or grey lenses. A shape with a bold personality, these oversized flip-up women’s sunglasses feature precious yet subtle hand-chiseled motifs and gold metal interlocking GG logo. The color choices include combinations of shiny dark or blonde havana, shiny light horn, shiny black, shiny crystal matched to gray, brown or yellow lenses. Blending a r�tro inspiration with innovative details, these high-quality sunglasses feature precious hand-chiseled titanium d�cors, metal core wire and adjustable nose pads. Bold and fashion-forward, they are characterized by high-impact combos of black acetate matched to gradient clear or yellow lenses, dark havana with solid green lenses and light horn with solid nicotine lenses. Entirely Made in Japan according to the highest form of hand-crafted expertise, they represent legacy and innovation at its best. At once precious, bold and irreverent, these sophisticated Sixties-inspired women’s sunglasses metal evoke the shape of an eye. Clusters of Swarovski crystals on the front further enhance its sinuous silhouette countered by the slim and linear metal temples. Available in gold, black and light rose, they feature flash silver lenses. These soft-edged unisex sunglasses in acetate are spruced up by microstuds, an all-over sprinkling of crystals and heat-embossed Gucci logo on the temple. They are available in melanges of shiny black/gold/jet hematite with gray or clear lenses and in havana/gold/shadow golden with brown or clear lenses. A true brand iconic shape and runway staple, these genderless handmade sunglasses in acetate take their cue from an intellectual and unconventional world. Available in combinations of shiny black/crystal with solid grey lenses, shiny light havana with solid green lenses, shiny flamed khaki havana with solid gray lenses and shiny flames grey havana with solid brown lenses. A Gucci hallmark since the 1950s, the green and red web motif is a longstanding icon that is constantly reimagined with flair and versatility to contemporary effect. A number of variations on a house specialty and exclusive treatments characterize a crop of new styles where the web pattern appears as a flash of glitter, as an urban-driven detail or as a colorful block statement. Girly and distinctive, these round-shaped women’s acetate sunglasses feature the GG and the web motif, two of the house’s most iconic logos, revved up by glittering, treatments that elevate the cool factor. They are available in a variety of colors and combinations of glitter and shine, including black, green/red, havana, emerald, silver plus pops of fuchsia. A sophisticated, bold and inventive web print adds twist to the front of these trendy round metal women’s sunglasses. The small GG interlocking logo soldered on the temples and edgy bumble bee motif on the end tip add an unexpected twist, seamlessly melding the past and the present. Available in a rich color palette where gold, silver and ruthenium fronts are matched to shiny black, shiny blonde or dark havana temples, at times with a hint of glitter. The choice of lenses includes shaded grey, green, brown to solid green, blue to violet/light pink. A classic that transcends time, these aviator women’s metal sunglasses are characterized by a sophisticated and inventive web print on the front. The small GG interlocking logo soldered on the temples and the bumble bee motif on the end tip add an unexpected twist, seamlessly melding the past and the present. Available in a rich color palette where gold and ruthenium fronts are matched to shiny black, shiny havana and shiny blue temples, at times with a glint of glitter. The choice of lenses spans from flash gold to solid green and brown to shaded green, blue and gray. Slightly vintage and quintessentially elegant, these injected metal and acetate men’s pilot sunglasses feature a discreet enameled web pattern that further elevates the appeal of this longstanding signature detail. The metal Gucci logo on the temple adds the finishing touch. An array of colored lenses in mirror gun, shaded dark brown, green, nicotine, solid polar gray and polar green complement combinations of gold and ruthenium metal matched to shiny acetate in black, dark or blonde havana and flamed gray. Soft-edged with a vintage appeal, these men’s aviator shapes feature a discreet enameled web pattern that further elevates the appeal of this longstanding signature detail. The metal Gucci logo on the temple adds the finishing touch. They are available in shiny black, shiny dark or blonde havana, shiny transparent mud and in a contrasting combo of shiny flamed gray havana with black. Bold, timeless and extremely versatile, the animal motifs are true overarching signatures that bond legacy and immediacy in striking mixes. Beside the classic GG logo, the tiger has become a recurring motif, inspired by the myth of Greek God Dionysus, as well as the bumble bee. These oversized cat-eye women’s sunglasses in acetate are adorned with the tiger symbol on the right temple and with the GG on the left one, creating an unexpected contrast between yesterday and now. They are available in shiny black with gray lenses or shiny havana with shaded green lenses. These special edition women’s sunglasses feature an exclusive and cuttingedge handmade chevron treatment whose uniqueness is further elevated by three iconic symbols – the GG logo, the stud and the tiger.